Living Solar, and SunPower have partnered with Local First of Southwest Colorado to offer rebates for Local First’s members! For Local First member businesses, solar systems over 10kW will receive a rebate for $0.20 per watt, up to $10,000. This rebate comes in the form of a check after the solar system has been installed, as with current utility rebates. Local First business members must sign up for the Alliance program rebate at the beginning of the solar assessment process. Employees of Local First member businesses are also eligible for the Residential rebates described below. Please call Living Solar if you would like us to present the details of this benefit program at your next employee meeting. 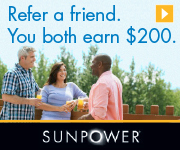 Local First individual members, as well as employees of member businesses, also qualify for a $0.40/Watt rebate, up to $2,000, through SunPower’s Alliance Program. Like the commercial program, a rebate check will be sent after the system is installed, as with utility rebate checks. Local First business member employees must sign up for the Alliance program rebate at the beginning of the solar assessment process, and let us know which Local First member company they work for.